Perfect for home, school or office. Paper clips are made from the highest quality steel. Feature a bright, corrosion-resistant finish. Giant paper clips, each 2' (50mm) long. Pack of 10 boxes of 100 each (1000 clips in all). Made in USA. 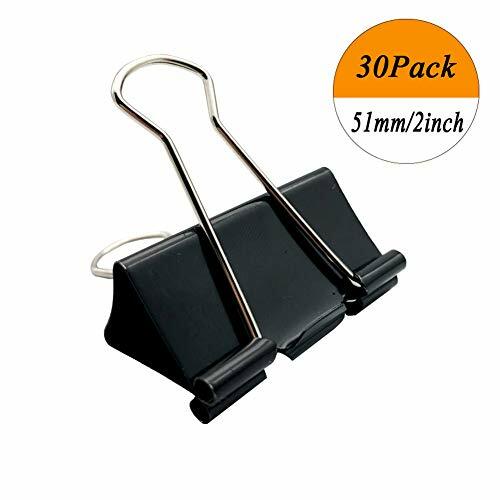 Description Our binder clips are made of tempered steel, durable and strong to use, Assembled with steel arms, the clips provide an extra strong grip for your documents. We offer popular price but top rated premium quality, timely and friendly service. Features - No rust on papers - 100 pieces, black metal iron - 2" width (5 pack), 0.8" Capacity; 1.6" width (5 pack), 0.7" Capacity; 1.3" width (5 pack), 0.6" Capacity; 1" width (15 pack), 0.5" Capacity; 0.75" width (25 pack), 0.4" Capacity; 0.59" width (45 pack), 0.3" Capacity - Binder clips and package are both reusable - Strong metal clamps with an opaque black finish - Keeps files bound together, prevents papers from slipping or pulling out - Tempered steel construction provides extra strong hold Application Purpose: Everybody. Place: Hotels, Office, Schools, Restaurants, Stores and crafts. Clips have soft, comfortable handles for easy squeezing. 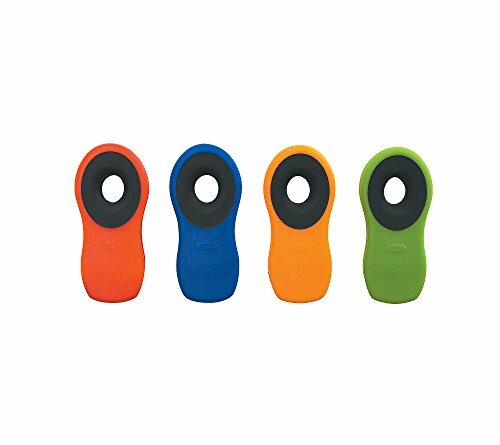 Each clip features a non-slip grip on its inside to keep contents from slipping out. Great for a multitude of uses in the kitchen, office or bedroom. 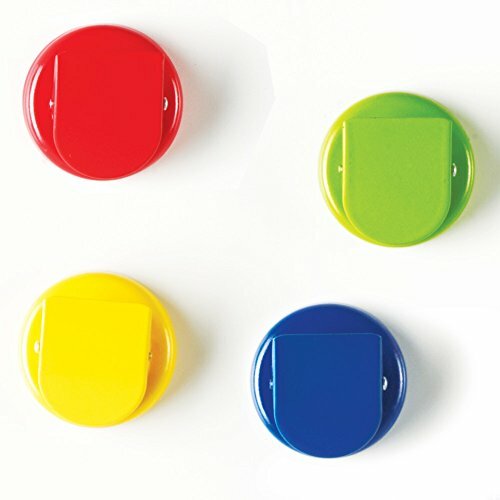 Pack of four clips in assorted colors. Imported. 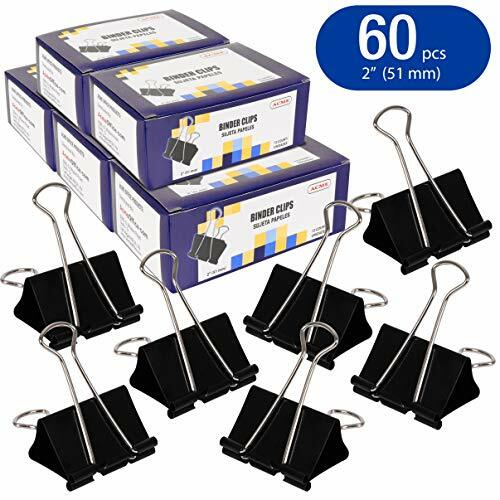 These classic black binder clips designed by U Brands add stability in organizing important papers throughout your home office, classroom, and or work place. Assembled with steel arms, the clips provide an extra strong grip for your documents keeping you organized and ready to work. Clips can be reused with the ability to bend back into shape after each use. 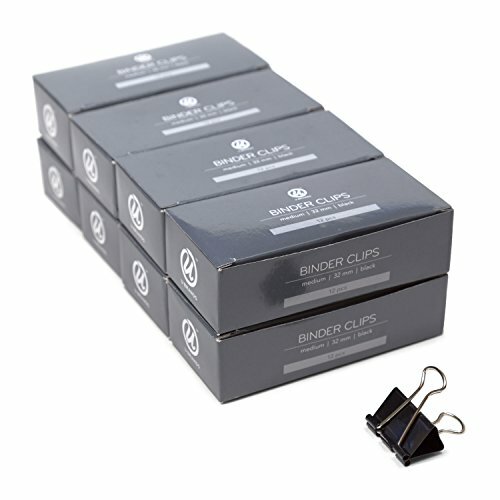 I deal for ring binders, these clips make a great addition to your office supplies. 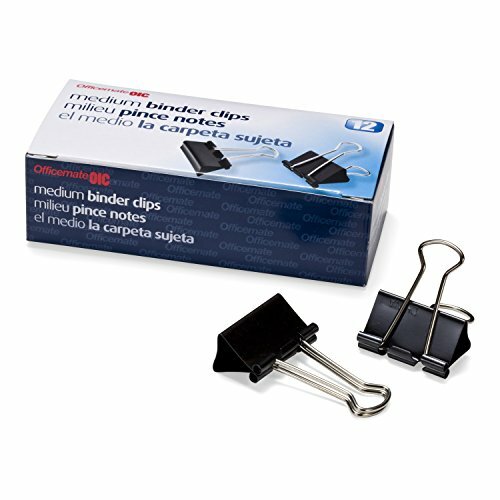 The binder clips feature a 1.25-inch or 32mm width and 0.5-Inch paper holding capacity. Packaging makes for a convenient way to keep clips stored and neatly kept in your office space. U Brands products are designed with U in mind! 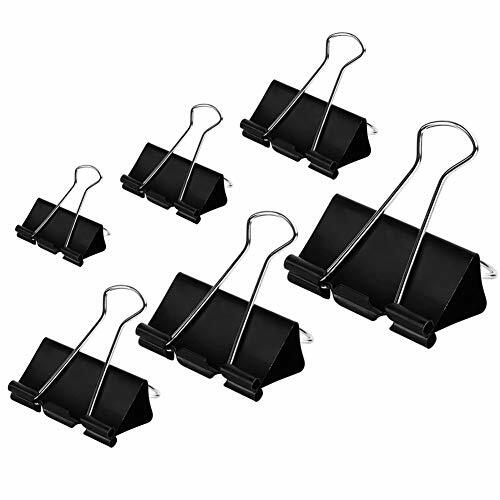 Our binder clips are made of tempered steel, durable and strong to use. Assembled with steel arms, the clips provide an extra strong grip for your documents. We offer popular price but top rated premium quality, timely and friendly service. Features - Will Not leave traces on paper - 24 pieces, black metal iron - 2" (51mm) width, 0.8"Capacity. 樂 Out of all the choices why choose Daily Needs Binder Clips? Durable & Built to last. We stand behind all of our products 100% Satisfaction Guaranteed! 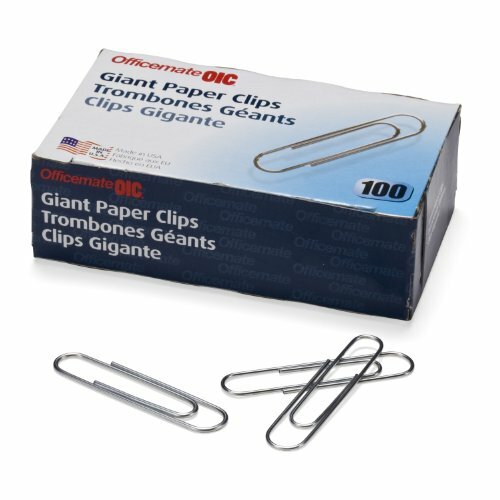  FREE BONUS 100 Paper Clips! Large Selection 6 Different sizes + Bonus Paperclips + Plastic Storage Container! Storage Container helps organize your binder clips as well as protect them from getting tangled or breaking. Makes a great desk organizer , has dozens of uses!  Steel Construction & Spring Guarantees longevity. Provides extra strong hold without slipping or releasing of your papers or crafts. Paint is sealed this way paint does not come off on your documents, papers or crafts.  Multiple Different Uses- Paper clip to hold papers or documents together, can be used at home, office , school etc can also be used for storage, hanging or arts and crafts the possibilities are endless! Storage- These Binder Clips Come Inside A Durable Plastic Reusable Container For Easy Storage & Organization. 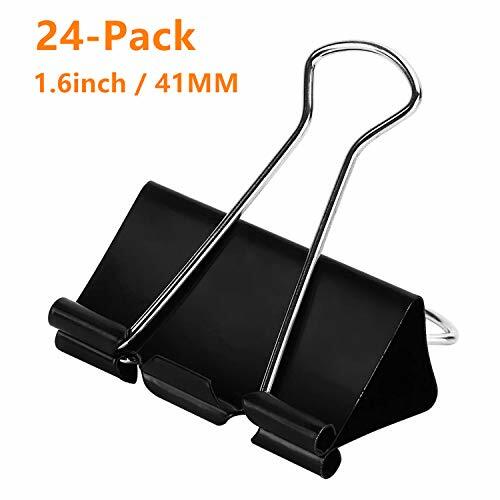 Description Our binder clips are made of tempered steel, durable and strong to use, Assembled with steel arms, the clips provide an extra strong grip for your documents. Features - No rust on papers - 24 pieces, black metal iron - 1.6" (41mm) width, 0.7"Capacity - Binder clips and package are both reusable - Strong metal clamps with an opaque black finish - Keeps files bound together, prevents papers from slipping or pulling out - Tempered steel construction provides extra strong hold Application Purpose: Everybody. Place: Hotels, Office, Schools, Restaurants, Stores and crafts. 1.Packed in clear tub with screw lid to keep your desktop or your desk drawer organized. 2.The binder clips assorted with shiny silver lever arm, squeeze to open with ease, release for firm grip. 3.Tempered steel construction and silver arms provide strong grip force for these large paper clamps, they can hold a stack of papers top to 20mm thick firmly. 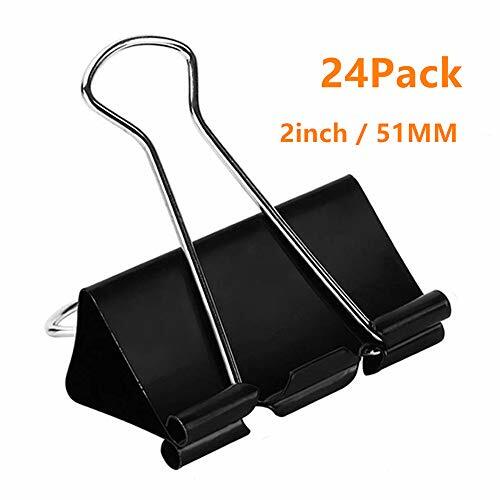 4.Our binder clip sizes spring back into shape quickly and could stay in good condition for a long time even after repeated use, durable and long-lasting. So you may organize and reorganize, fasten and unfasten repeatedly. Our paper clamps assorted are made of premium metal with a opaque black coating, easy to open and close, perfect for your daily use. Your purchase is fully protected when you order today. 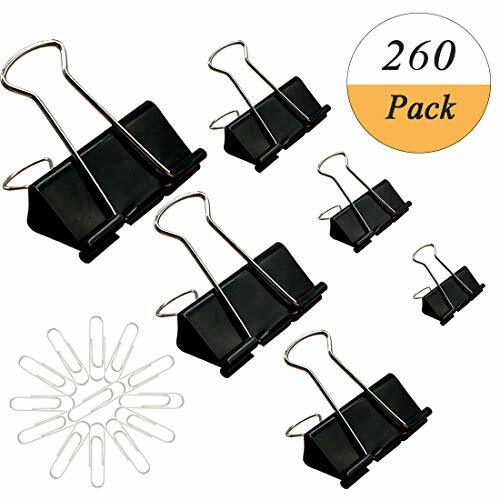 If you are not satisfied with your black binder clips, contact us at any time, we will get you back within 24 hours try our best to make things right. PREMIUM MATERIAL: The fold back clip is made from premium strong metal clamps with a smooth colorful powder coat finish and nickel plated handles ,rust-resistant, strong, durable and reusable , which are perfect for your every day needs. CONVENIENT: Our paper clamp are the best clips to quickly and temporarily bind stacks of loose papers that are too thick for staplers and paper clips. And these metal binder clips are packaged in a reusable plastic tub for easy storage. 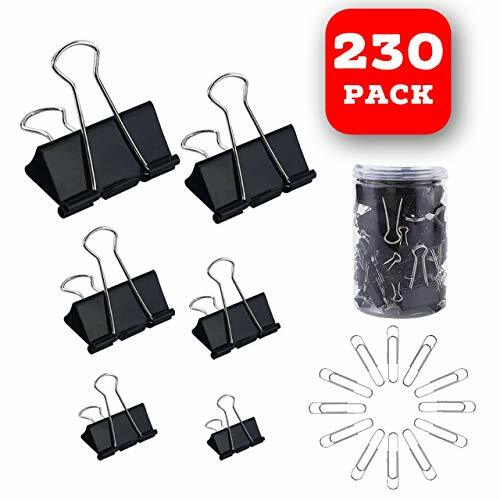 MULTI-FUNCTION: Our 120 packs office clips keeps files bound together preventing papers from slipping or pulling out, use different size binder clips to manage different thickness files, help to fix and seal some specific things. APPLICATION: Perfect for office, home and school daily use, suit for students, teachers,and so on. They can also be used for food clamps, clothes, furniture and outdoor applications. 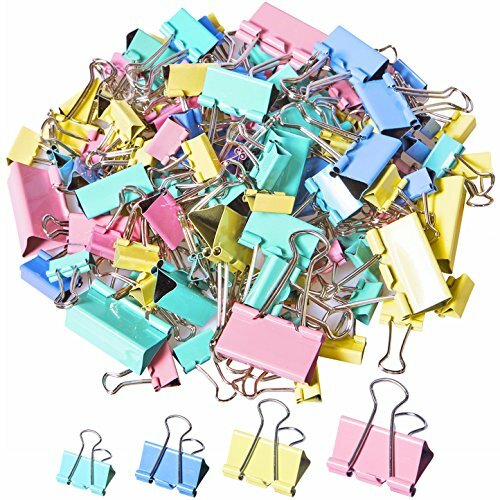 BINDER SIZES : Assorted size(15mm, 19mm, 25mm, 32mm) with assorted bright colors( pink, blue, yellow, cyan)binder clips can meet your different needs and different styles. Assorted Color General Purpose Rubber Bands (Red, Blue, Green and Yellow) For Home and Office Use: +50 Size #18 Can Be Pulled 17. Shipped by AMAZON, 100% MONEY BACK, RISK-FREE SATISFACTION GUARANTEE. Refill Pack for HiQin's Original Item: HQ-3001-40-1 . Bulk Pack 40 Pcs, 10 pink elephants + 10 blue birds + 10 silver cats +10 golden dachshund dogs. Gift Ideas, Fun Office Gift Birthday Gifts for Women Coworkers Animal Lovers. Nolvety Gift Idea, Fun Office Gifts Birthday Gifts for Women Coworkers Animal Lovers Mother's day gift. 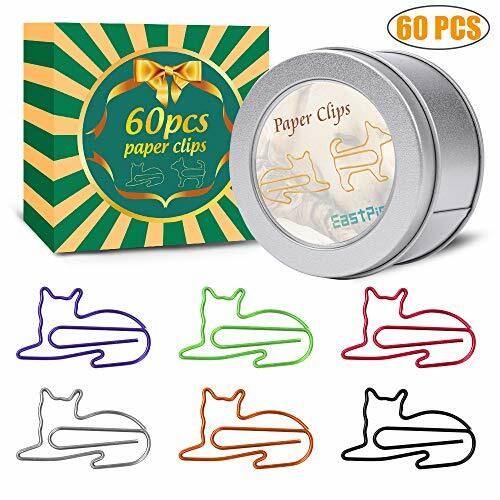  UNIQUE ORIGINAL DESIGN EastPin vivid designed cat paper clips made from PET coated metal wire material which is nontoxic and harmless, colorfast, strong but lightweight, which makes it great gift idea for cat lovers and women. EastPin cat binder clips help you sprucing up your files. Smooth surfaces of cat accessories prevents snags and marks on papers. Cute binder let you finish your work in a funny way. 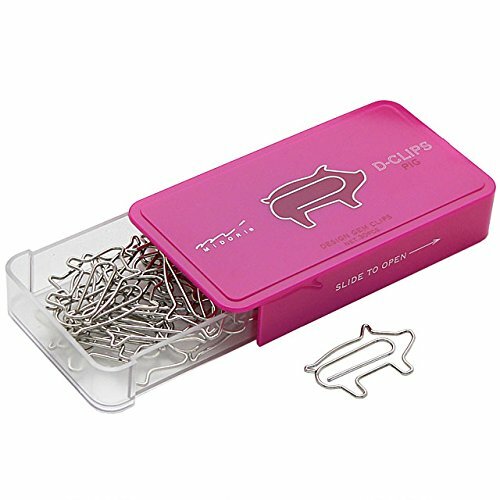  FUNCTIONAL USAGE EastPin cat shaped paper clips have the same functions as traditional paper clips. Funny Cat office supplies paper clips keep your notebook, markbook, scrapbooks, calendar markers and others item securely attached; Office accessories lighten up your work desk, hold office helpers! 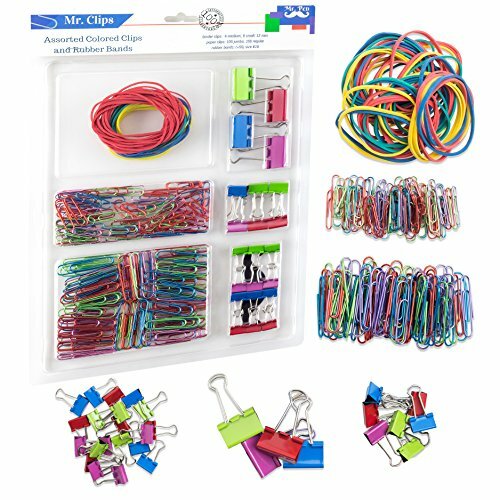  ASSORTED COLORS 60PCS of novelty paper clips in 6 different colors, including 10 RED + 10 PURPLE + 10 SILVER +10 GOLDEN + 10 BLACK + 10 GREEN. 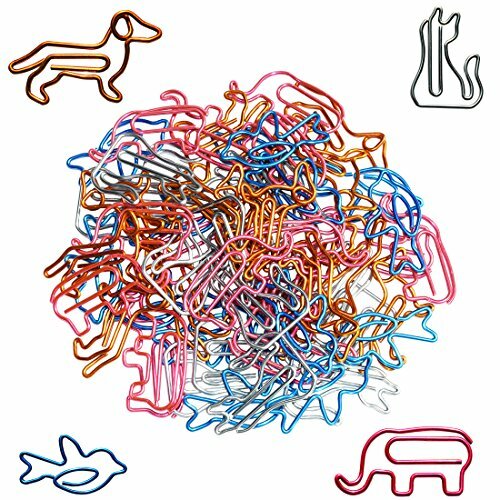 EastPin animal paper clips meet heavy load needs of your daily use and created to withstand many years of use. Assorted colors are neatly classified in the container. Durable clips have 1.29inch length and 0.82inch width capacity that can hold up to 20 sheets or more thicker papers.  CAT LOVER GIFTS FOR WOMEN Cat gifts for cat lovers, cat gifts for women on birthday festivals. Give a fun present, school supplies as teacher gifts, cat office supplies for cat lover gift for women, animal lover gifts add a little pleasure to life. Fancy paper clips giving you the option to select the perfect gifts for cat lovers for a special occasion. A well designed little gift box to impress gift recipient!  CUSTOMER SERVICE 30 DAYS 100% MONEY BACK GUARANTEE! Office clips provides 1-year warranty and 24 hours friendly customer service for our customers, any product quality of EastPin cat accessories, we will provide timely after-sales service. So just feel free to purchase cat paper clips. Color coded and neatly divided, these paper clips are desgined by U Brands to brighten up your office and work space. 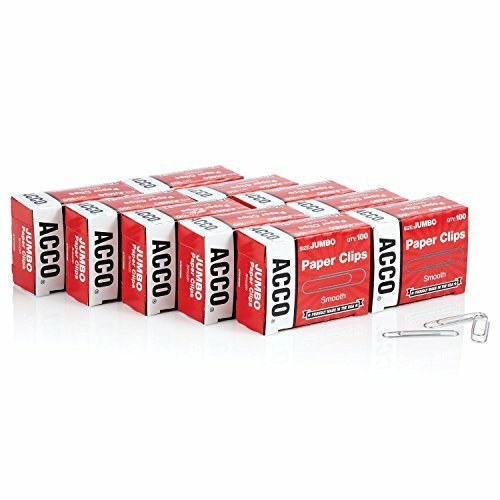 Perfect addition to your office supplies, paper clips can be used for stationery, fasteners, envelops, and more! 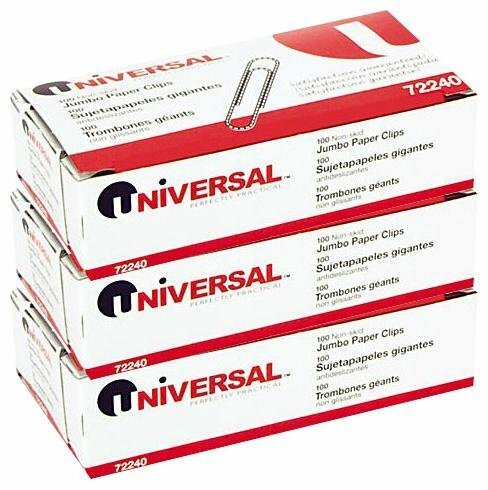 The paper clips feature a 1.125-inch or 28mm and 2-inch or 51mm capacities. Comes in appearling, round package perfect for office organization. U Brands products are designed with U in mind! UPDATED BONE SHAPE TO AVOID EMBARRASSMENT ! 30 Pcs, 15 Dogs + 15 UPDATED Bones, packed with a steel box. Gift Worthy. Perfect as a BIRTHDAY gift, a THANKFUL gift, an Office Gifts for women coworkers. 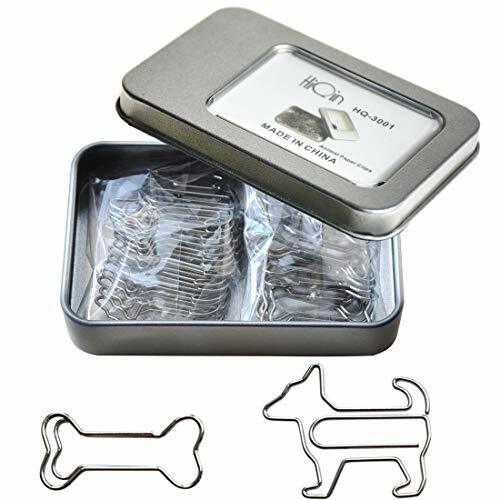 Paper Clips of Animal Dog Loves Bone. UPDATED BONE SHAPE TO AVOID EMBARRASSMENT ! Superior holding power; keep files organized and secure. Handle can be remain upright for handling and hanging, folded flat for storage, or can be removed for permanent binding. Ideal for temporary binding or fold flat for everyday use. Each clip is made with a corrosion-resistant coating. p>Our promise to you: Customers are our top priority, which is why our products offer a lifetime replacement guarantee, so you can be positive you are receiving the highest quality products Our highly appreciates all customers' opinions to improve the selling ,also if anything you unsatisfied, pls contact our customer service department for probable best solution. Scroll Up & Click Add To Cart Now! 160 pieces binder clips and 100 paper clips for keeping documents together, assorted sizes, black and silver color Can Be Reused, Clips Spring Back Into Shape When Removed Wide range of uses: These metal binder clips fit for office, home using, school using, especially for students, teachers to bind their documents, handles can fold up for handing or can be removed for binding.value. Our promise to you: Customers are our top priority, which is why our products offer a lifetime replacement guarantee, so you can be positive you are receiving the highest quality products Our highly appreciates all customers' opinions to improve the selling ,also if anything you unsatisfied, pls contact our customer service department for probable best solution. Scroll Up & Click Add To Cart Now! Binder clips paper binder clips for keeping documents together, black and silver color Can Be Reused, Clips Spring Back Into Shape When Removed Wide range of uses: These metal binder clips fit for office, home using, school using, especially for students, teachers to bind their documents, handles can fold up for handing or can be removed for binding. SIZE - 2 inch binder slips. 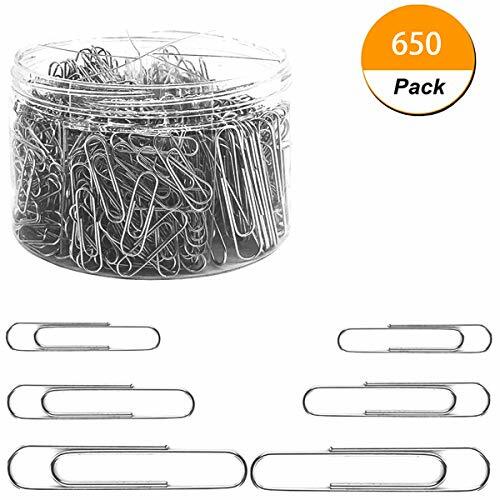 Paper Clips Medium and Jumbo Size, 650 Pieces (28 mm, 33mm and 50 mm) (Silver) 650 Pieces silver paper clips: Come with 450 pieces 28 mm paper clips in silver, 150 pieces 33 mm paper clips in silver and 100 pieces 50 mm jumbo paper clips in silver. 3 assorted sizes: maximum to meet your different using needs. Abundant quantity: 650pcs paperclips can be used for a long time. Good quality: Paper clips are vinyl coated, resist corrosion, smooth surfaces prevents snags and marks or rust on papers for metal clip. Hold tight to papers and do not slide right back off. 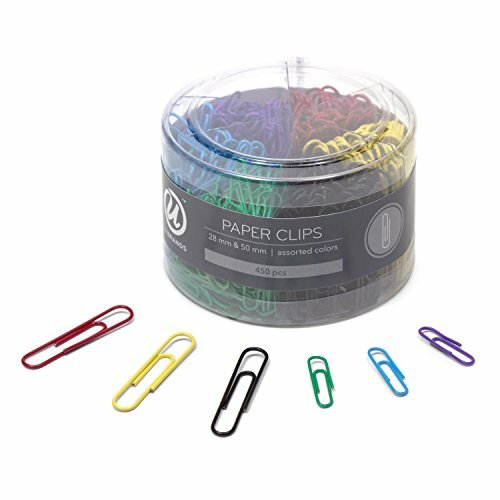 easy to store: Medium and large size paper clips lie in a plastic container with 6 separated compartments, 3 sections for 28mm paper clips, 2 for 33mm paper clips and 1 for 50mm paper clips. Common use: Paper clips can be applied for stationery, fasteners, envelops, and more. Paper clips are 28 mm, 33mm and 50 mm are durable for your paper clipping needs. Package includes: 450 x 28mm paper clips 150 x 33mm paper clips 50 x 50mm paper clips BUY IT NOW -- 100% SATISFACTION GUARANTEE ! 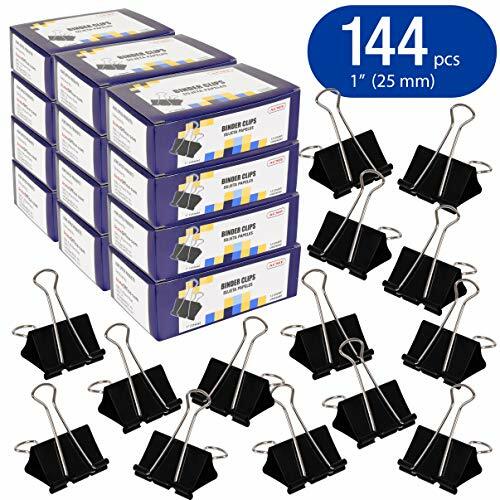 Includes 144 1" mini binder clips perfect for binding paper, files, or folders together! 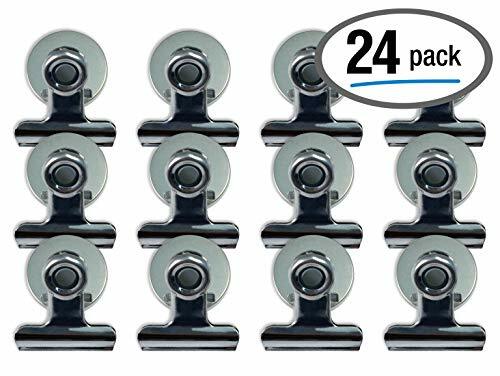 24-pack of stainless steel magnetic clips can be used to hold, hang, display, clasp or secure many household items. Use in the home, garage, craft room or office. A hole in the clip press provides a handy way to attach other objects to the clip such as a ring of keys or pen on a string. *Please note these are magnetic clips and not individual magnets or part of a magnet set. USES: Attach to metal surfaces; Can hold a myriad of household or office items from paper to cloth or fabric, from poster board to clipboards and more.